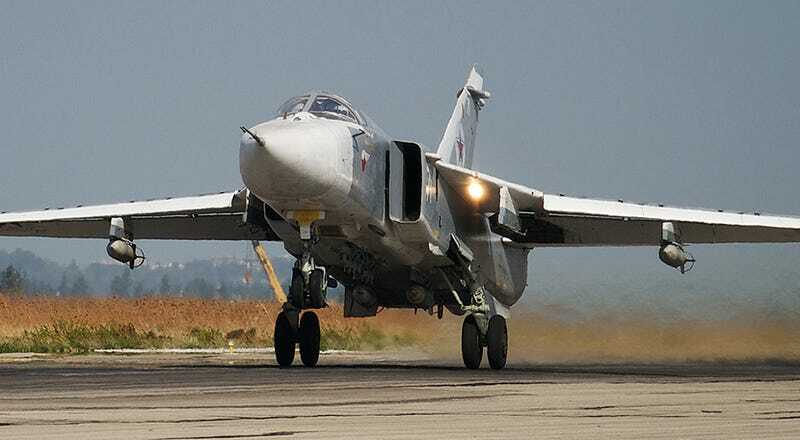 A Russian Su-24 Fencer attack jet, one of about a dozen based at Russia’s forward operating base in Syria south of the port city of Latakia, was shot down after Turkey claims the aircraft had passed into its airspace and did not respond to 10 separate warnings spaced over five minutes. Multiple points of view recorded the shoot-down of the Su-24, with the aircraft streaming flames and plunging towards the ground from medium altitude (around 20,000 feet). Russia has insisted that the Su-24 did not violate Turkish airspace before being engaged and shot down by Turkish F-16s, although Russian news outlets claim the jet was shot down by a ground-based air defense system. The Russian Ministry of Defense has also claimed that the pilots were able to eject although their fate remains unknown. The aircraft was operating along the border in Latakia Province in Northwest Syria. There have been multiple previous Russian incursions into Turkish airspace since Russia’s air campaign over Syria has begun and Turkey shot down a Russian unmanned aircraft in October. Additionally, Turkey shot down a Syrian MiG-23 in early 2014. A NATO member shooting down a Russian attack jet is somewhat uncharted geopolitical territory. We will keep this page updated as this story unfolds. UPDATE: 2:22AM PST- Graphic images and video of what appear to be one dead or badly injured pilot wearing flight gear that matches that worn by Russian attack pilots operating in Syria have emerged on Twitter. Although the imagery looks highly authentic, we cannot confirm that it is indeed genuine at this time. Russian helicopters are said to be scouring the area at this time as part of a search and rescue effort. Update: 3:02AM PST- This video supposedly shows one of the pilots being captured alive by Turkmen forces. UPDATE: 3:23AM PST- We are still awaiting an official confirmation that one of the Su-24 crew members is dead, although the official word from the rebel group that found him says that he is. UPDATE: 3:55AM PST- NATO to hold emergency meeting in Brussels concerning today’s aerial engagement. Update: 4:29AM PST- Foxtrot Alpha has warned that an incident like the one that occurred today was highly possible since before Russia kicked off their air war in Syria. CNN has produced a chart showing the countries that are bombing in Syria’s crowded airspace today. Missing are Israel, who is rumored to have conducted an air strike on Hezbollah positions in Syria today, and Jordan. Arab nations (Saudi Arabia, Bahrain, UAE, Qatar) that took part in coalition air strikes early on are largely not flying them anymore. UPDATE: 5:26AM PST- One of the search and rescue helicopters is said to have been attacks by Free Syrian Army fighters, possibly with a TOW missile. It is not clear if the aircraft was totally lost in the attack or if it made an emergency landing. UPDATE: 6:47AM PST- A video has emerged that looks like Syrian rebel “TOW Hunters” striking a helicopter (an Mi-8/17) while it is on the ground. Why it set down is unclear, and we have no guarantee that this is the helicopter in question, although the video does match the terrain and the tweet above. UPDATE: 7:27AM PST - Reuters reports that Turkmen rebels shot both pilots as they parachuted to the ground after ejecting. UPDATE: 8:03 AM PST - Reuters is now reporting that the a US spokesman was quoted as saying the Russian pilots of the Su-24 were warned repeatedly with no response before being shot down. Russia Today also reports that Russian Foreign Minister Sergey Lavrov has cancelled his Wednesday trip to Turkey due to the incident and “increasing level of the terror threat in Turkey,” with Russian state tourism agency Rostourism suggesting the suspension of all sales of tourist packages to Turkey.